When I began divesting myself of Apple tech, I knew there would be sacrifices in the games department. My laments about the quantity of games in the Google Play store are, however, more than offset by the quality of those who rise to the top outside of Apple’s walled garden. Case in point, UniWar. UniWar is a straight-up, hex-based war game. When I say war game, understand that I mean it is a game of pure and unadulterated strategy. There are no dice rolls. Nothing is left to chance. UniWar provides players with near perfect information about the pieces in play and how they will interact with each other on the battle map. In this, UniWar is closer to something like Go than it is Risk. In many ways, UniWar feels like a port of a perfectly polished tabletop game. These comparisons might make UniWar sound dreadfully intimidating to someone with only a passing interest in war or strategy games. In actuality, it’s only slightly more complex than chess in terms of its formal rules. Players begin by choosing from one of three, somewhat StarCraft inspired, factions: the Sapiens (Terrans), Titans (robot Protoss), or Khraleans (bugs). Although each race’s units have their own foibles, I’ve found the three are generally well balanced against each other. Players can learn UniWar’s strategic nuances through either a single player campaign or skirmish matches against AI opponents. Though former is mostly the same as the latter, the campaign makes a point of teaching players how to exploit the features of various race-specific units. Initially, I was a bit annoyed that the only path to player versus player competition was through victories against the AI. The design choice made sense after I lost my first three AI skirmishes. In fact, calling those early experiences “losses” might be underselling things a bit. I don’t want to put too fine a point on this, but I sucked out loud at UniWar, and I wouldn’t have stood a chance against even a quarter-decent human player. My failures were all the more perplexing in the face of the game’s simple objective. 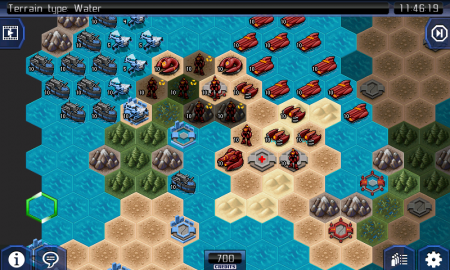 Winning at UniWar requires one army to occupy or capture all of an opponent’s base tiles. Every unit’s attack, mobility, and defense stats are modified by the map’s various terrain. 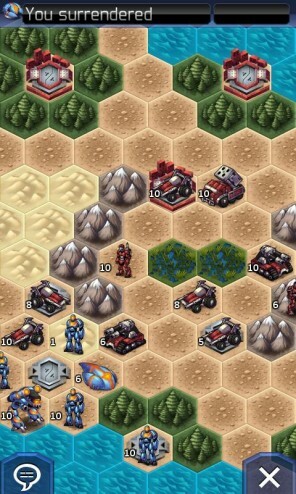 For example, light infantry will generally get a defense and attack bonus in a mountainous tile. Heavy vehicles will generally take mobility and defense penalties for rolling through a swamp. None of these buffs or penalties are hidden from players. So with all the data at hand, why did I keep losing? First and foremost, I let the game’s passing similarity to StarCraft trick me into thinking an early game blitz against an enemy base was a good idea. I sent lone units into battle, content to trade tank for tank with my foe. What I should have been doing was thinking like a proper military commander. Embracing lines of battle, areas of denial, and retreating injured units – rather than fighting them to death – saw me to my first victory. Once I stopped playing like Jim Raynor and started playing like Honor Harrington, it became an entirely new game. It’s also worth mentioning that UniWar has a very passionate community of players. At any given moment there are usually a couple hundred people playing the game. UniWar also seems to have attracted a rather decent sort of player, though my experiences are far from a representative sample. I’ve had people alternatively compliment me on victories or offer feedback on my poorer gambits. The developers have also embraced a dizzying array of player-generated battle maps. The combination of these factors keeps UniWar feeling fresh more than six years after its release. In the final assessment, UniWar is a smart game that balances a simple rule set with an incredibly deep strategic layer. Tempting as it is to call UniWar a good “entry level” war game, I think it offers the sort of strategic experience that would appeal to any type of strategy aficionado. The game’s interface is clear and intuitive, particularly when it comes to preventing misclicks and accidental orders. And as a final feather in the game’s cap, there are absolutely no micro-transactions. Well played, TBS Games, you’ve made an outstanding mobile game.